Rest easy at our affordable and recently-renovated hotel near Savannah, GA’s Historic District. Located just a 15-minute drive away, guests can easily zip into downtown or take our convenient shuttle service. Our lodgings near the Savannah Historic District provide guests with a relaxing place to stay that feels like home. Discover the beating heart of Savannah and the largest National Historic Landmark District in the United States! Directions: Follow the I-95 N to Martin Luther King Jr. Blvd and take exit 167A to access the Historic District. Step into another world. 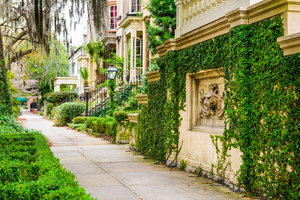 Amongst historic homes are Savannah’s evenly spaced park squares with monuments and plaques tucked amongst trailing flowers and lush greenery. Tour a number of parks beneath an umbrella of emerald canopies, including the popular Forsyth Park or the intricately spaced 24 parks squares throughout the neighborhood. Sightsee on foot, by carriage, or on the water on a riverboat cruise! Some of the most popular things to look for are the iconic doors on restored 18th-century homes, the subject of many Pinterest boards. 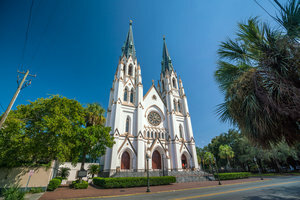 Tour museums, churches, and the mansions of Savannah. The district boasts a stunning variety of architecture, including simple Colonial, storybook Victorian, and pastel Georgian-style buildings. The Gothic ambiance is one of the biggest draws for visitors interested in embarking on a ghost tour or venturing through a mossy cemetery. For history buffs, book a historical re-enactment tour or visit carefully preserved forts from both the Revolutionary and Civil War eras. Visit the First African Baptist Church and Lafayette Square’s St. John the Baptist Cathedral for awe-inspiring places of worship. Window shop among four blocks of restored warehouses! Known as the entertainment corner of town, there’s no shortage of events and live music at this waterfront market. Dine at over 100 restaurants, including favorites such as The Olde Pink House, located in a restored mansion, or Alligator Soul for eclectic and seasonal Southern comfort food. Browse amongst shops, dine at restaurants, and enjoy the charming nightlife scene with live music and fresh brews. With a charming and quaint atmosphere, the Riverwalk is one of the most popular areas of town. Book your stay at our cozy hotel near Savannah, GA’s Historic District for close proximity to the city’s most popular neighborhood.